Zoo, Farm, Jungle, Dinosaurs, & Sea Creatures. Animals bring out all sorts of timeless wonder and joy from people of all ages and walks of life. Many of us still remember our childhood pets while others still live with a couple (or more) creatures of their very own today. We love animals, but we're not all that keen on the things that go along with them, such as cleaning up messes and accidental damage that they can cause. The good news is that instead of transforming your home into a zoo or a barnyard for your next party, we have all sorts of fun and delightful animal shaped balloons that you can use at any animal-themed party or celebration gathering. 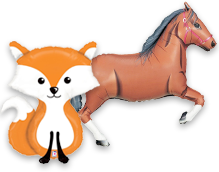 Our selection of animal-shaped party balloons are absolutely perfect for kids parties, safari theme parties, or any animal lover. Browse our menagerie of zoo, farm, jungle, dinosaur, and sea creature balloons that you and your party animals are sure to love. We have many different types, breeds, and species of animal balloons for sale, including dinosaur latex balloons, dinosaur helium balloons, farm animal shaped balloons, safari animal balloons and jungle animal balloons, fish balloons and under the sea party decorations, large animal balloons, and countless other kids party balloons. Browse our impressive online inventory and buy animal balloons online at 1SuperParty.